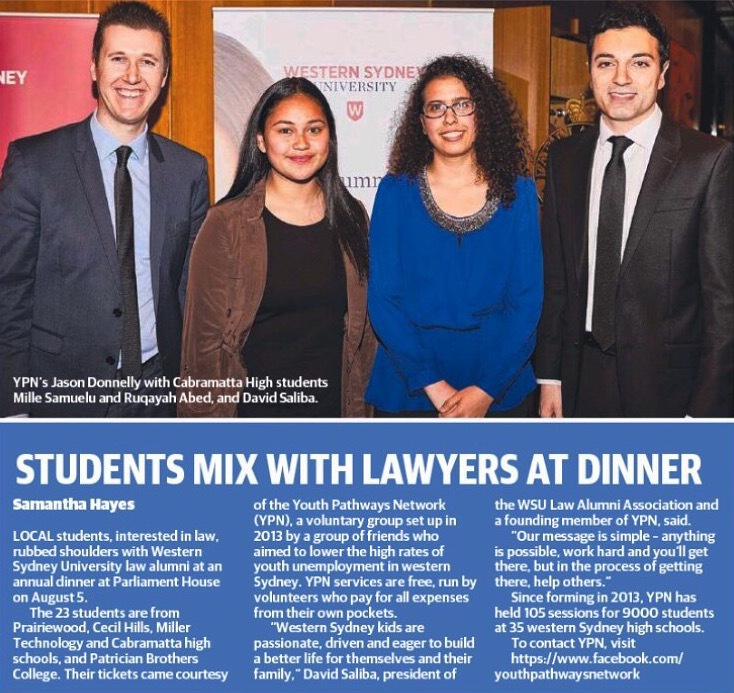 Local students, interested in law, rubbed shoulders with Western Sydney University law alumni at an annual dinner at Parliament House on August 5. The 23 students are from Prairiewood, Cecil Hills, Miller Technology and Cabramatta High Schools, and Patrician Brothers College. Their tickets came courtesy of the Youth Pathways Network (YPN), a voluntary group set up in 2013 by a group of friends who aimed to lower the high rates of youth employment in Western Sydney. YPN services are free, run by volunteers who pay for all expenses from their own pockets. “Western Sydney kids are passionate, driven and eager to build a better life for themselves and their family.” David Saliba, president of the WSU Law Alumni Association and a founding member of YPN, said. Since forming in 2013, YPN has held 105 sessions for 9,000 students at 35 Western Sydney High Schools.